Specialists in support for hidden disabilities at Friendly Access, along with the School of Simulation and Visualisation (SimVis) at The Glasgow School of Art and Crag3D Ltd have received continued Scottish Government and European Social Fund support from the Social Innovation Fund to expand on research and development of their innovative work it was revealed today (Friday 29 June 2018). The Dynamic Interactive Navigation for Familiarisation and Desensitisation project helps support people who have hidden disabilities and mental health conditions. Using a VR compatible mobile phone, and a VR headset costing as little as £1.99, members of the general public will be soon able to use an app to help prepare for the challenges of visiting stressful places. The apps will create immersive 3D digital versions of real environments from airports, classrooms and places of employment. It gradually increases stressors helping people to practice overcoming the barriers which these stressful situations often create. Hidden disabilities can result in high levels of discrimination, fear and anxiety, often leading to isolation and poverty. Environmental stressors such as certain sounds, lighting and crowd behaviour can become significant barriers towards autonomy, impeding many vulnerable individuals doing what others might think as everyday activities. Facilities, such as airports do sometimes offer initiatives as pre-visit familiarity tours which can be of great help to many individuals and families. This app will expand on this by allowing people to control and experience virtual worlds from a chosen safe space such as their home. The benefit to airports would be a more relaxed visitor and positive experience for many, complementing the current Disabled Person Needing Assistance (DPNA) resource available. 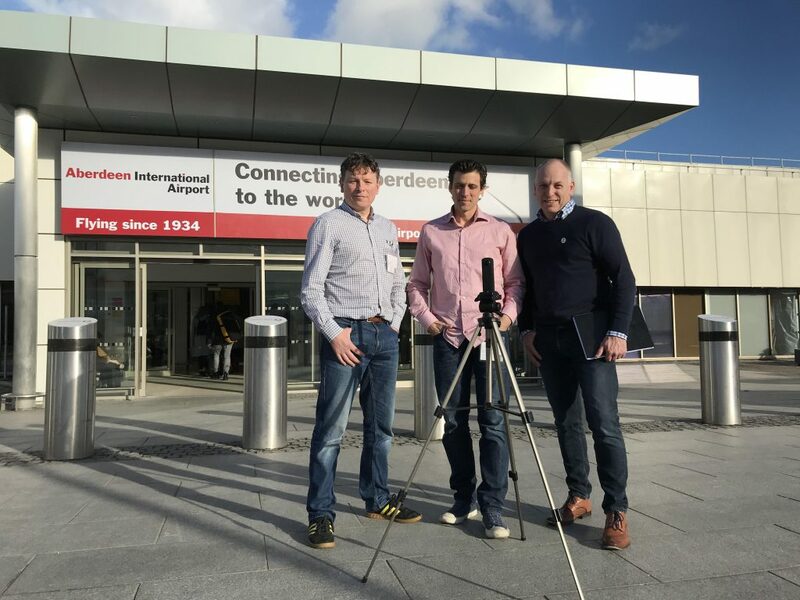 “Aberdeen Airport has welcomed the opportunity to work closely with Friendly Access, Crag 3D and the SimVis on the development of this app.” says Fraser Bain, Aberdeen Airport Duty Manager, who has been leading the airport’s drive to become a more accessible and inclusive environment, believes the app will be of great benefit to their passengers. In this stage of the research project, the team will work alongside people with hidden disabilities and mental health conditions over several months to test the development. Additionally, a number of academics, professionals, service providers and organisations involved with the project will help to refine the concept as it evolves. “The Fragile X Society are delighted to be involved with this innovative project”, says Sandra Thoms, Support and Development Worker, Scotland. Fiona Bain, Lead Community Partner, Department of Work and Pensions, “It’s really encouraging to hear about this project and we’re excited about the possibilities of being involved”. The team’s research aims to validate effectiveness and demand for facilities, develop design standards and provide free access to apps from their websites. With repeated use and exposure of these apps, it is hoped many individuals will overcome the barriers that these stressful situations often create. “Individuals living with hidden disabilities or conditions including hypersensitivity and anxiety are often placed at an unfair disadvantage compared to their peers in society,” says Chief Executive, Friendly Access Glyn Morris, “This can often lead to isolation and poverty. We know how certain environments can act as significant barriers and based upon our idea, we set about how we could improve this issue. “In this research, we are making the most of the omni-present mobile technologies across society,” says Dr. Matthieu Poyade, of SimVis, “The app will provide a series of interactive simulations which will help empower people with hidden disabilities to confront stress producing contexts in the real world. This way they can get used to challenging situations via digital environments from the safety from their home.”. Findings will be documented and submitted to relevant international conferences, an early demo was shown at ACM International Conference on Multimodal Interaction and a poster was presented at EuroVR in 2017 during the first stage of research. We hope one day all society understands the true impact for people with hidden disabilities and mental health conditions. In the meantime, our drive and purpose is with improving access across Scotland and help enable everyone to lead the life they choose. Friendly Access brings individuals and services they wish to access together, without fear and isolation through lack of understanding and support. No one should be forced into living in isolation. Friendly Access put ‘autism friendly and relaxed’ performances into theatres across the UK. We are now firmly focused on setting the bar even higher for inclusion everyday and everywhere. The School of Simulation and Visualisation at the GSA is a leading centre of teaching and research in the areas of 3D visualisation, 3D sound, speech recognition, haptics (touch), gesture-based interaction and camera-based tracking. SimVis has a large portfolio of projects with business and industry in Scotland, the UK and Europe, centred on expertise in real-time 3D visualisation, 3D sound, modelling, motion capture and animation. In particular, SimVis has built a reputation for world leading work in 3D visualisation for heritage, as well as for our work in flagship projects such as the visitor experience for the Battle of Bannockburn visitor centre. Beyond heritage, SimVis works on a wide range of motion and 3D data capture and visualisation projects for commercial and industrial partners. The School of Simulation and Visualisation sound dubbing studios are regularly used for network television and film productions, as well as in the school’s own visualisation projects. Crag3D creates interactive digital experiences with animation and 3D models providing clients with 360° visualisation and fully immersive interactive 3D environments.